One of the things I like best about springtime here is the juxtaposition of hot and cold, especially in the high country. The sunshine is warm, but winter lingers in the shade. I’ve gone hiking in shorts and t-shirt through 15 cm of snow in past years. This weekend, we didn’t make it up to snow, but there was spectacular frost on our little Saturday jaunt. 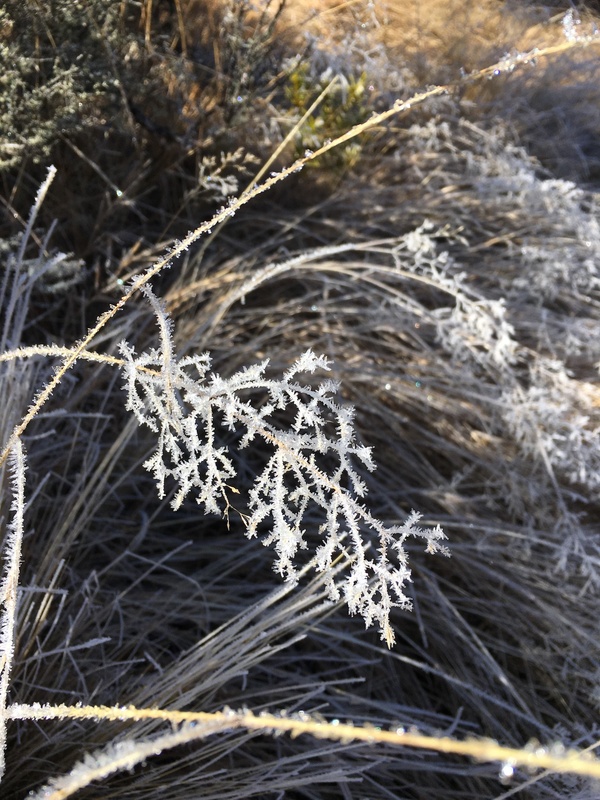 Hiking up the shaded side of a hill, we were treated to glistening plants as the first rays of the sun hit thick frost. In addition to the frost, we crunched over a lot of needle ice. 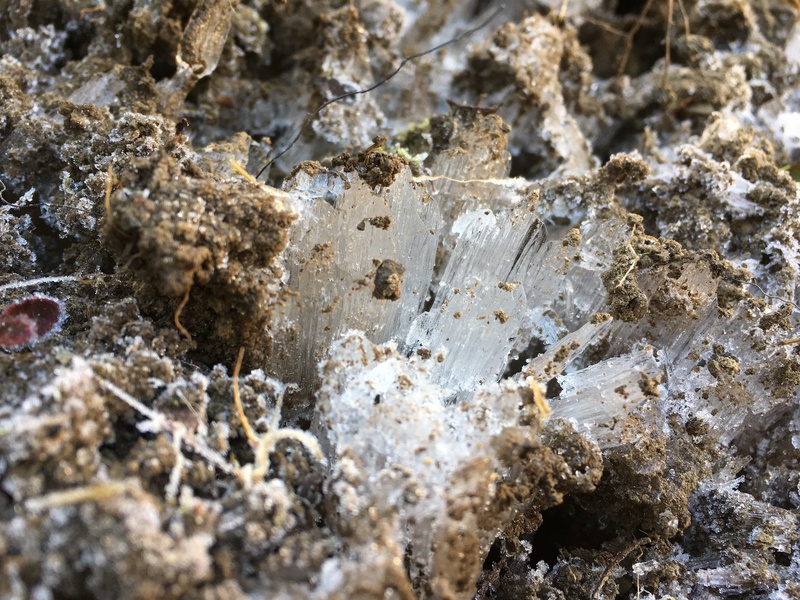 Needle ice can occur when the soil temperature is above freezing, but the air temperature is below freezing. Liquid water rises through the soil via capillary action and freezes on contact with the air. As more water is drawn upward, the ice needles grow in length. They’re common in the high country in springtime, when warm sun heats the ground during the day, but the temperature drops quickly after dark. Ice needles are more than just a curiosity. They’re a significant factor in soil erosion, because they often push soil upward along with the ice. This loosens the top layer of soil, making it prone to erosion by wind and water. The air was cold on Saturday morning, and as we started up the hill, we were well-bundled. But like all good tracks in New Zealand, this one started off by going straight up. Between the climb and the sun, we were soon stripped to our t-shirts, enjoying the crunch of ice underfoot and the warmth of the sun overhead.